In-furrow starter fertilizer almost always increased early season growth or vigor above no starter. Harvest moisture was lowered slightly when a starter was applied, generally enough to pay for the fertilizer costs, but not for a profit. 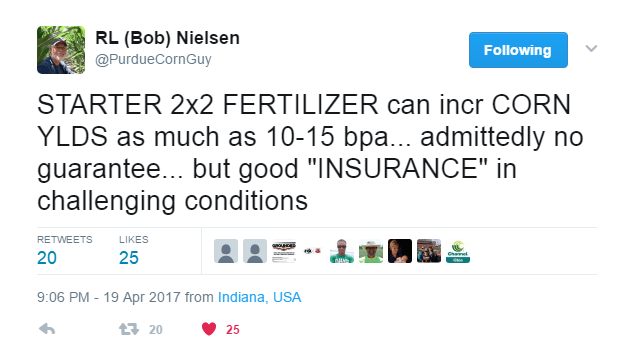 Starter fertilizer did not increase corn yield based on early to late planting dates or early to late relative maturity hybrids. Yield benefit from starter fertilizer was primarily found when no broadcast phosphorous (P) was applied at a recommended rate, and soil testing P levels were low. Therefore, Dr. Kaiser recommended to pay close attention to P soil testing levels and fertility regimens when using starter fertilizer. There is no one size fits all P regimen. 5 gallons per acre (GPA) starter of 10-34-0 had similar effects as 5 or 7 GPA starter in low soil testing P conditions and when no P was broadcast in any P soil testing field. Dr. Kaisers results were quite interesting and based on rigorous small-plot experiments. 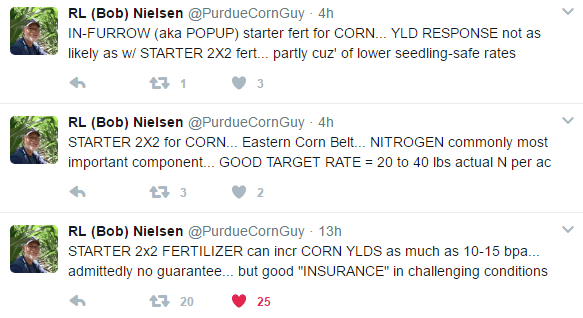 Research I personally have been involved with in North Dakota has been largely inconclusive on pop-ups due to having only a few environments tested, and general difficulty with small-plot research and this type of treatment, which has always left me with questions about starter fertilizers in corn. However, in speaking with Extension Soil Specialist Dr. Dave Franzen here at NDSU, he had some general recommendations that he gives. His general thoughts from personal communication I had with him are that 3 GPA pop-up is a high enough rate for an expensive fertilizer, and that everyone in North Dakota planting corn should use a starter fertilizer in the form of a popup or some form of side by side. His last note to me was that dribbling a pop-up on top of the soil surface for corn production does not make much sense here in North Dakota, even though it works in the Eastern Corn Belt. Consider some limited testing on farm each year to continuously prove this concept to yourself, and tweak your setups. In this continuingly low corn commodity price environment, consider what costs you might cut and not lose yield. Perhaps a 1-2 GPA reduction in in-furrow starter will provide all the benefit at slightly less cost. There are alternative options to in-furrow such as 2×2 fertilizing with dry fertilizers that could reduce cost as well. Above all, if you have some in-furrow large scale field research this year, I would thoroughly enjoy coming and see it for my own knowledge moving forward, just give a me a call/text.